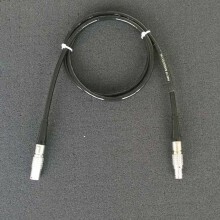 Includes: Integral cable connector, a 3ft (1m) mating cable and a 1/4 in NPT female or G 1/4 female pressure connector, user manual and calibration certificate. 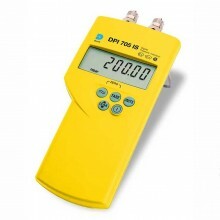 Please note: Due to the large number of pressure ranges and models available for the DPI705R pressure meter (absolute, differential and gauge) we order as required. Please contact us for expected delivery times. 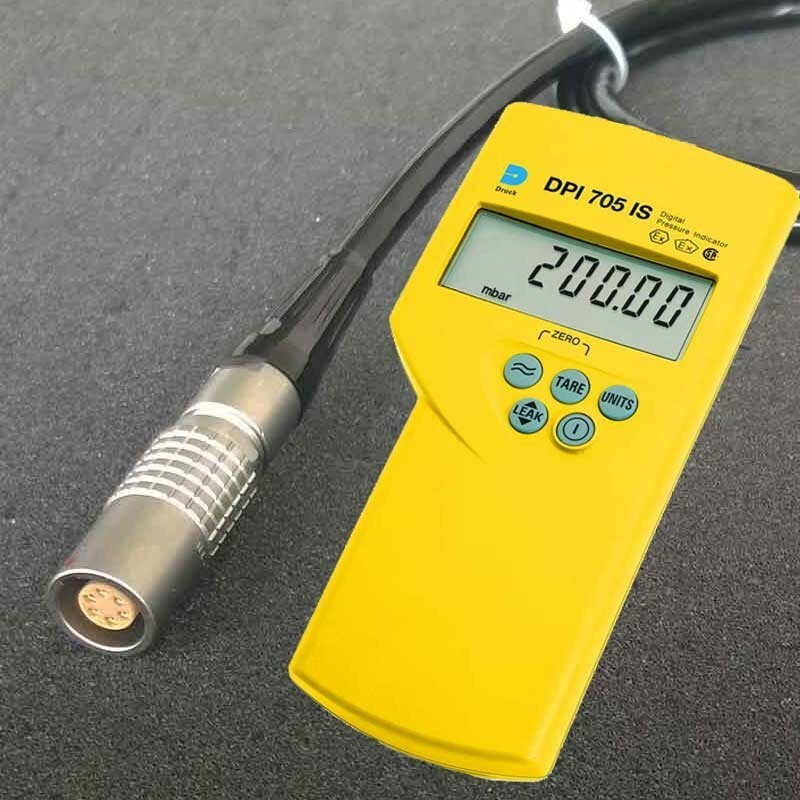 Compact, robust and lightweight, the GE Druck DPI 705 IS pressure indicator is designed for single handed operation and provides many essential features required for routine maintenance and system troubleshooting. 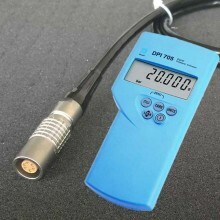 The GE DPI 705 IS indicator uses a micro-machined silicon transducer to produce a pressure reading in units of pressure measurement. 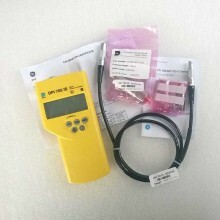 This intrinsically safe pressure indicator is certified by BASEEFA and CSA and has sucessfully met the examination and test requirements: EN50014 : 1992 and EN50020 : 1994 and EEx ia IIC T4 -10°C Tamb +50°C (15°F to 120°F). 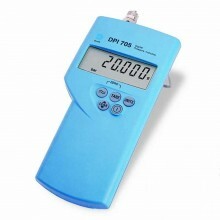 The DPI 705 IS pressure indicator may be used in zones 0, 1 or 2 for industries with any gas group. If a key is not pressed within 10 minutes then the instrument times out and switches off. To perform a leak test, press the LEAK key 3 times. 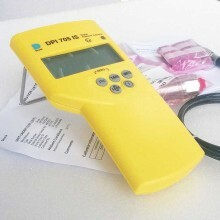 The instrument counts down 60 seconds displaying the leakage at the end of the 60 second period. See video below. 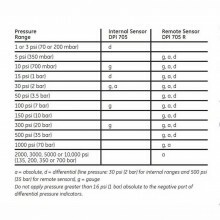 A zero should be performed on gauge and differential instruments before measuring pressure. Note: A zero can only be performed on absolute pressure indicators if a vacuum is first applied to the pressure port. A single alarm can be set to operate when the displayed pressure value rises above the alarm setting. The alarm causes the display to flash and a beeper to sound for one minute. Adjustable zero and auto power off. Suitable for use with liquids compatible with the stainless steel diaphragm. Ambient temperature indication in °C or °F. 60 second leak test mode. Averaging filter for unstable pressure measurement. Adjustable audio/visual high pressure alarm. Dust and waterproof to IP54. Pressure ranges Ranges 0 to 70 mbar (1 psi) through to 700 bar (10,000 psi). IS Class I, Groups A, B, C & D, T4 Exia; Class I, Zone 0, AEx/Ex ia IIC T4 Ga (-10°C ≤ Ta ≤ +50°C) to CSA Std. 157-92, UL 913 (7th Ed. ), CAN/CSA-C22.2 No. 60079-0:11, CAN/CSA-C22.2 No. 60079-11:11, ANSI/UL 60079-0:09 and ANSI/UL 60079-11:09. Ex ia IIC T4 Ga (-10°C ≤ Ta ≤ +50°C) to ATEX IEC 60079-0:2011 and EN 60079-11:2012. 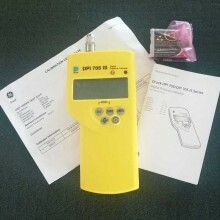 Druck DPI705R IS warranty One year.